Published just two weeks after U.S. Army Gen. and NATO force commander Austin Scott Miller barely escaped a fatal insider gunman’s attack, the latest quarterly watchdog report on progress toward a peaceful Afghanistan is packed with grim statistics on low recruitment levels for Afghan forces and civilian battle casualties. The Kabul government’s ability to control or influence political districts this year reached the lowest level since tracking began in November 2015, said the report released on Thursday by John Sopko, special inspector general for Afghanistan reconstruction. The central government’s control over districts shrunk by 16 percentage points, while districts contested by the enemy Taliban rose by 11 points, and insurgent control or influence rose by 5.5 points. The strength of the Afghan National Defense and Security Forces shrunk by 1,914 personnel since last quarter and by 8,827 personnel since the same period last year, SIGAR said. That puts the force at around 40,000 personnel, or 11 percent below its target strength of 352,000 personnel. Civilian casualties, according to the United Nations Assistance Mission in Afghanistan, were 8,050 (2,798 deaths and 5,252 injuries) from Jan. 1 through Sept. 30, 2018. That’s a 39 percent hike from the same period in 2017, which was a record for civilians hit by air strikes since 2009. Casualty figures from U.S. sources with Operation Resolute Support are much lower, at 102 from Jan. 1 to Aug. 15, the report noted. And “The Taliban repeatedly claim not to cause civilian casualties, but their actions show otherwise,” Gen. John Nicholson said in August. He also asserted that there have not been significant changes in control of political districts. So-called “green-on-green” insider attacks on U.S. and Afghan government personnel totaled 56 from May 17 to Aug. 26, killing 28 and wounding 14, for a total of 121 casualties since January, the report said. Nor is the economy—on which so much of the move to stabilize depends—progressing. A severe drought cut the wheat harvest to a deficit of 2.5 metric tons, SIGAR found, and 275,000 people this year were displaced, 52,000 more than last year. 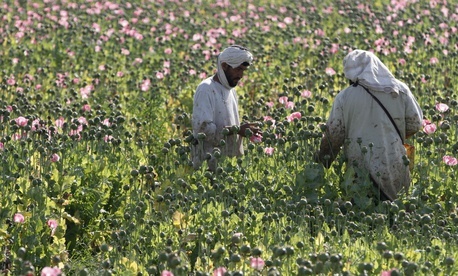 The $1.5 million-per-day effort to reduce dependence on the poppy harvest for the narcotics trade has failed, with poppy cultivation this year at four times the level of 2002. Counternarcotics seems to have fallen completely off the U.S. agenda for the Pentagon, the report said, though the State Department has folded it into its general agenda. Agencies beyond Defense are also struggling. The U.S. Justice Department finds the Kabul government attorney general’s performance deficient, citing poor cooperation and misleading communication on anti-corruption efforts. The Promote program run by the U.S. Agency for International Development to advance the status of Afghan women has spent $89.7 billion in three years, but the agency has not fully assessed its progress,” SIGAR noted. And in the contracting realm, SIGAR’s suspension and debarment program referred three individuals and two entities for suspension or debarment based on evidence developed as part of investigations in Afghanistan and the United States. These referrals bring the total number of individuals and companies referred by SIGAR since 2008 to 905, encompassing 505 individuals and 400 companies.